As it prepares for the inclusion of Pokerstars and Full Tilt Poker into its market, New Jersey reported strong Internet gaming revenues for the month of December 2015 earlier this week. According to New Jersey's Division of Gaming Enforcement, Internet gaming revenues in December of 2015 were $14.0 million, up 30.8% from December of 2014. 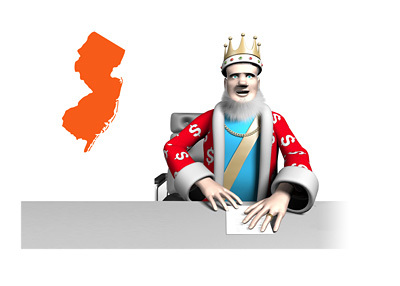 With the state collecting 15% of Internet gaming gross revenues, this means that New Jersey collected a little over $2 million from the growing industry last month. Of the $14 million in Internet gaming revenues that were collected in December of 2015, $1,984,137 came from "peer-to-peer" games (online poker), while the remainder ($12,060,163) came from "other authorized games" (casino games). The state's peer-to-peer revenues were actually down from December of 2014, while the other revenues were up substantially. All of these companies, which are active in the state with the help of online firms such as Bwin.Party and WSOP.com, will likely see their revenues drop dramatically once Amaya, Inc. officially enters New Jersey. Pokerstars and Full Tilt Poker both received approval from the New Jersey Division of Gaming Enforcement late last year, though a formal launch date hasn't been announced as of yet. It wouldn't be surprising, given the clout of Pokerstars, if the other companies operating in the state saw a 30%+ decrease in their Internet gaming revenues once the online poker giant formally launches their New Jersey offering.